What can you do with empty 55 gallon plastic barrels? Why not recycle them into an attractive low maintenance container garden. Earth boxes are self watering containers which take the work out of gardening while providing healthier plants and more vegetables. While there are other earth box designs, my goal was to remake plastic barrels into attractive pots which could be placed anywhere around your house. Here's how you do it. A 55 gallon plastic barrel and a plastic tube are the main components of the earth barrel. I used an empty barrel we get soap in at work and the tube is a recycled plastic leg from a storage shelf. Both were free and looking for a new job. My cost per earth barrel was about $4 because I painted them and already had the tools. One can of spray paint will put 2 coats on 2 planters. The first step is to rinse out the barrel and plug the access holes (if necessary). A spigot was used to dispense soap from my barrel so I inserted a 3/4" PVC plug into the hole. Check the top of your barrel (end with holes) for places where air holes may have been made by simply puncturing the barrel. Air holes are made to allow the barrel to breath and can be patched with a bit of plastic epoxy. Air holes in the bottom are not a problem. Do this step first so as not to forget it later. Once filled with soil, this pot weighs around 120lbs and is hard to lift. You will not be happy when you see water running out from under your "earth barrel". First mark a line around the barrel 4" from the bottom and a second 18" from the top (photo 1). To more easily mark the barrel I made a Sharpy holder/stand out of scrap wood (photo 2). Three 15/32" diameter holes are made at 4", 8" and 18" from the floor in the stand. The 8" height will be used later. While it's not critical to make perfect cuts, this stand helps you start with a straight line at least. Next cut the barrel into three pieces using a jigsaw (photo 3). Drill holes in the middle section next to the lines for introducing the jigsaw blade and proceed to cut along the mark until you've made both cuts. Setting aside the top and bottom pieces, mark a rectangle 8" wide by 28" long on the middle piece (photos 1 & 2). Cut this piece out without cutting completely across the middle piece as we will be cutting another 1 1/2" band from the other side later. Drill a series of 3/8" holes in the 8" x 28" piece (photo 3). These holes are to allow water to perculate into the soil. There is not a set number of holes necessary so you can drill more or fewer holes as you like. Work the perforated plastic piece into a cylinder and clamp in place (photo 1). Drill 1/8" holes and insert long aluminum rivets to hold the pieces together (photos 2 & 3). Turn the barrel bottom upside down and mark a circle 1/2" small than the internal diameter of the bottom cylinder (photo 1). A one gallon paint can makes the perfect sized circle for this project. Cut out the circle with a jigsaw (photo 2). 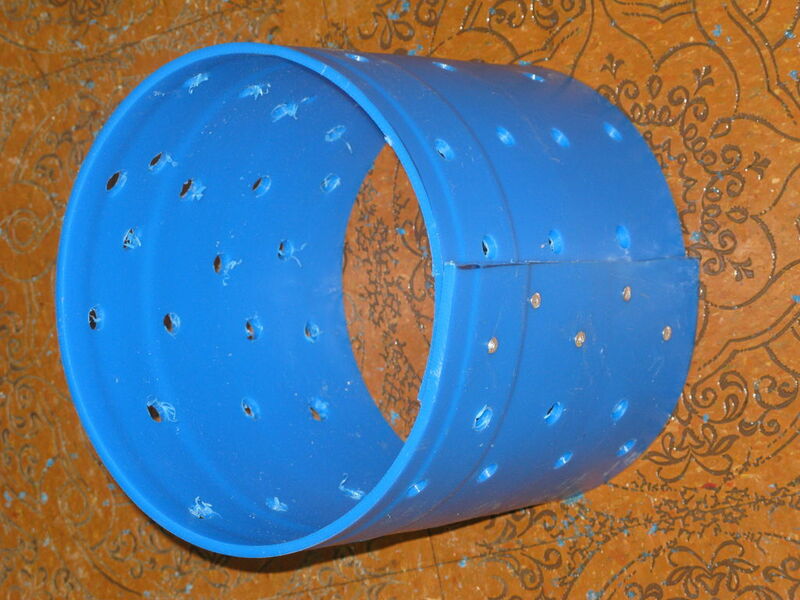 Place the bottom cylinder over the hole and mark around the outside (photo 3). This is so you do not drill holes in the bottom too close to the cylinder. While the cylinder is in place, also mark 4 holes to be drilled in the cylinder and 4 holes in the bottom where zip ties can be used to secure them together. Drill 1/4" holes at your marks in the bottom and cylinder. Drill 3/8" holes in the bottom which should actually now be called the seperator screen (photo 4). Again there is no preset number of holes so drill as many as you'd like. When you are finished drilling, attach the cylinder and seperator screen with 4 zip ties. The zip ties insure the cylinder stays centered over the hole. A water spout allows you to fill the bottom water reservior. You'll need to drill a hole in the seperator screen for PVC pipe to pass through (photo 1). For this you'll need a hole saw larger than the outside diameter of the pipe. The fit does not need to be tight so anything close is fine. Cut a 45 degree angle on the end of your PVC pipe to allow water to easily flow into the bottom reservior (photo 2). Photo 3 shows how the assembled internal components sit inside the barrel. One last step, you need to make a drain hole to prevent overwatering. Make a mark 8" from the floor and drill a 1/2" hole below your mark. In this way, water cannot get above the seperator screen. Some people like to have 3 or 4 holes in case your earth box isn't setting level. When you get ready to set up your earth box, put the water spout and the drain hole on the same side so you can see when it's full. If you're not planning on painting your earth barrel, you're done. Simply put the seperator screen inside the top of the barrel with the cylinder on the bottom. Insert the PVC pipe and you're ready to fill with dirt. If you want to paint, you can buy spray paint made for painting plastics at any home store. One can will paint 2 planters. I thought it was worth the extra effort since I'm putting these on our patio. Make sure you have your planter in the right place since it will be hard to move. It holds 3 cubic feet of soil, and around 8+ gallons of water (estimate), which is about 200 lbs when full. So chose wisely. The bottom cylinder should be packed tightly with wet soil (not mud). I pack an inch or so and spray it with the hose. Once the bottom cylinder is full, you'll want to mist the dirt as you pack it but not as wet as in the cylinder. Fill your pot to the brim with a little crown in the middle (photo 1). I made a circle of fertilizer in the middle after digging a little trough (photo 2). I put 2 cups of 10-10-10 general use fertilizer in the trough. The fertilizer sits under the plastic which keeps it from dissolving too quickly and will feed your plants all season. When next year comes, remove the old plastic, dig out and replace the old fertilizer and you are ready to go. The blue strap holding the tarp on was the last cut from the old barrel. You could use rope or a bungy cord, but this was easy and I had the scraps to use. The next step shows you how. On the remnant of the middle section, mark a line 1 1/2" from the edge and cut with your jigsaw (photo 1). You'll also need to cut a 1 1/2" x 7" piece from the scraps. Cut the big band and use the 7" piece to rejoin the ends with a 2" gap (photo 2). Two long aluminum rivets on each end do the trick. This makes the strap the right size to go around the barrel and plastic. I hope you have found this instructable valuable and easy to follow (photo 3). "Earth Barrels" are a great use for unwanted barrels headed to the landfill. Fortunately, one barrel provides almost everything you need to grow some fresh veggies or flowers with minimal maintenance. Comments are appreciated and I am anxious to hear suggestions for improvement. I wanted to plant some pole beans and needed something for them to climb on. So before filling the pot with dirt, I drilled five 1/2" holes in the seperation screen to allow placement of plastic poles. After filling with dirt and installing the plastic, I simply wired the tops of the poles together to secure them. Flexing the poles inward creates tension against the inside of the pot bottom by the poles and makes a very stable trellis. Much better than trying to add poles to the outside of the pot later. Just waitin' on the beans. Great job. Instructions are well done. But too much work. I'll just cut mine in half and use the 4" perforated corrugated drain pipe method instead. You know, the one where you seal up the ends, stick a tube for over flow and insert a PVC pipe for adding water? But I really appreciate the idea of using the 55 gal drums. This will help with a bush if I so feel inclined. I've built the 5 gallon version, but instead of a container for a soil wick, I used plastic screen, poked through a hole in the bottom of the top bucket and stapled in place. Worked great, so I'm wondering if a fabric "bag" of some kind affixed to the top rim of a single barrel, and filled with soil,would work? Good question. I probably don't know enough about it to give an educated answer, but my initial thought would be whether the soil would get consistent water. I think you'd need some way of having the bag go to the bottom so it always has contact with water without it simply sitting in water. The center column gives constant assess to water and yet most of the soil isn't sitting in water. Maybe burlap cloth to hold the soil and cotton twine wicks to bring up the water? Where'd you get the 55 Gallon Drum? I tried my local carwash but they were out, so they said come next week; out. Come again next week; out. Last time I went; out. So yeah, I really don't know where to get them. Do they have them at resturants? Many times you can also find them asking the side of the road near Flea markets. Beverage companies have them, flavoring companies (snow cone flavor providers) have them. Look in local papers and they're often offered at $10 each. I also found some that laundry mats owners were selling. I got mine where I work. We get floor cleaner in them. I've seen people selling them on Craig's List. They were the craze during our recent drought for making rain barrels. so is there a drainage hole in the bottom of the barrel? Im thinking this might be a great solution for my balcony garden from preventing stains and water dripping on my neighbors patio. No hole in the bottom of the barrel. These would work very well on a balcony. The only time it might run out is when you fill it then you'll see some run out the side hole. But you can tell when it's getting full and stop before it actually runs out. Good luck! This is a great 'idble. I've used the barrels in the past. But, Iopted to cut them lengthwise for more surface area. Next year I'll just use your idea along with the lattice vine support. Great job! woooooooooooooow thats just wht i did !!!! Absolutely fabulous. Will look great when your vines are crawling down the sides of the lattice. Going to try your method of putting the fertilizer in a stocking. Great idea. Thanks! My newest version of the 55-gallon self-watering planters. I used plastic lattice, held together with plastic zip-ties for safety and for more plant support to cover the wires I string from drum to drum. I've grown watermelon, cantaloupe, tomatoes and this year a giant, bushel gourd. The soil mixture I like most is 5 cups lime and 5 cups 8-8-8 fertilizer per container. I put the fertilizer inside old stockings so that I can easily remove it at the end of the season (removing salts). Next spring, I use the same 5 cups lime/5 cups 8-8-8 fertilizer. Works great. Excellent! I used this but had to modify it slightly to work with my barrels. Mine have the lip top and bottom, so I had to cut one of them off. Also, have you tried using a table saw with this? I've made two, and the one a jigsaw, and the second with my table saw. I got much more accurate cuts on it, and it went much faster. I haven't used a table saw, but will give it a try on my next bunch. Great idea. Glad you were able to use this instructable. We've had a ton of tomatoes this summer and it's been so easy.